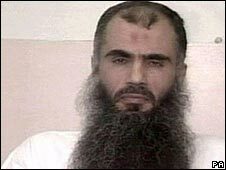 Abu Qatada, "Osama Bin Laden's right-hand man in Europe"
Abu Qatada had been held on a 22-hour home curfew, after winning the latest stage of a battle against deportation. Judges have agreed with ministers that he might flee - even though there is no evidence of such a plan at present. The cleric was arrested at his home in London in November. The UK wants to return him to Jordan. Mr Qatada says his conviction there for terrorism offences was unfair. A panel of judges at the Special Immigration Appeals Commission (Siac), which acts as the UK's national security tribunal, heard last month that the 47-year-old Jordanian-Palestinian could be plotting to leave the UK. One allegation related to an al-Qaeda message on an extremist website which was said to call on unnamed but influential preachers to join Islamist fighters in battle overseas. The Home Office alleged that Mr Qatada had also recorded a video sermon in his home, in breach of a key element of his bail conditions. Mr Qatada denied these allegations, saying he had no idea about the online messages, while the sermon was in fact a home video in which he could be seen telling his children about a Muslim festival. Other allegations, based on MI5 intelligence, were heard by the judges in secret. The tribunal said the open allegations were not enough to deny the preacher bail - and that the Home Secretary accepted he had not yet breached his tough bail conditions. The judges noted Mr Qatada and his legal team were looking in good faith for a neutral third country that was willing to take him - but added that was not a realistic prospect. "The secretary of state does not rely on any allegation of breach," said Mr Justice Mitting, chair of the commission. "Her contention is that the commission should form the opinion that it is likely that he will break his bail conditions by absconding." Revoking his bail, the panel agreed that material shown to them indicated a significant risk that Mr Qatada would flee because of changes in circumstances. Immigration rules allow a foreign national to be held in jail only as long as a deportation is likely to take place. Mr Qatada was bailed in June after the Court of Appeal ruled he could not be sent to Jordan. Judges said his conviction there may have relied upon evidence obtained by torture. Ministers have appealed that decision to the Law Lords - and the case could end up in Europe. Siac's decision to revoke bail is unusual and similar to the position in criminal courts. In those cases, a defendant on a very serious charge is almost always remanded, no matter how far away their trial may be. The cleric's bail conditions had included wearing an electronic tag, a ban on attending any mosque or leading prayers. He had permission to leave his home twice a day, for an hour each time. He was forbidden from using the internet, mobile phones and from meeting a long list of people, including Osama Bin Laden. Home Secretary Jacqui Smith said: "I'm pleased the court has agreed that Qatada should have his bail revoked. "He poses a significant threat to our national security and I am pleased that he will be detained pending his deportation, which I'm working hard to secure." But Gareth Peirce, the cleric's solicitor, reacted angrily, saying he had been jailed on the basis of something that could happen - rather than anything that actually had. "It becomes ever more difficult to imagine how we can effectively, or at all, protect the most basic rights of those we represent in this country," said Ms Peirce. "The history of the past seven years, as exemplified by what has happened to Mr Othman [Abu Qatada], is shocking to any who have an innate sense of justice and fairness. "While the Home Office may consider Mr Othman's ongoing detention to be an executive success, to any who truly value the rule of law and sanctity of the concept of due process, it constitutes another self-inflicted executive defeat." Does England have house arrest?